The Bellrays live at the London Barfly, 29 April 2005. A 61 minute live set shot with four cameras and featuring 18 songs of which some are previously unreleased. This album perfectly captures the band's singular sound, which combines two seemingly disparate forms of American music: the raw power of garage rock and the emotional drama of soul. "Imagine Tina Turner fronting the Stooges," goes one common description of the band, and although that hardly encompasses the BellRays' artistry, there is some historical truth behind the hook: If the BellRays' recordings and live performances are utterly of-the-moment, full of urgency and sheer presence, the seamlessness with which the Southern California outfit combines punk and soul also hearkens back to another time when the two were integrally connected. Detroit was the capital of both; Iggy, Ike and Tina actually shared the stage; and the MC5's aesthetic and politics drew explicitly from black music and counterculture. The BellRays first of two volumes - "Punk Funk Rock Soul - Vol. 1" is a taste of the foundation that is what makes The BellRays the unique band that they are. The title speaks for itself with all four tracks - "Mine All Mine", "Shake Your Snake", "Soul Girl" and "I Don't Wanna Cry" delivering genre specific power and punch. We wrote so much new stuff we needed 2017 and 2018 to release it. 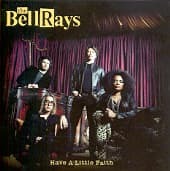 This is the starting point for what's happening with the BellRays just in time for Christmas. Look for volume 2 in February 2018.